The parent journal, Materials Today, is now open for original research article submissions. Materials Today Chemistry and Materials Today Energy are the two latest journals to be launched. Over the last two decades, Materials Today has established itself as one of the most respected sources of information in materials science and engineering, with the namesake journal recently achieving an Impact Factor* of 17.793, and its companion website covering news, opinion and interviews on the latest advances. Now, in addition to publishing invited reviews, our flagship journal Materials Today will also publish the most exciting original research papers from the materials community. Under the expert leadership of new Editors-in-Chief Professor Jun Lou of Rice University and Professor Gleb Yushin of Georgia Tech, the journal is now open for submissions showcasing the latest cutting-edge research. In tandem, the journal is becoming a hybrid open access and subscription title. But that’s only part of the story. We’re not just expanding a single journal; we’re launching new titles to offer comprehensive coverage across materials science. Regardless of the topic, article type or significance within the field, there’ll be a suitable journal within the combined Materials Today family. We want to give every materials researcher the opportunity to get involved with Materials Today. As well as expanding the scope and reach of Materials Today, Elsevier is also launching a series of specialist companion titles. Like Materials Today, each new title will offer a combination of the best peer-reviewed primary research and invited reviews from experts in the field. The first of these new titles, Applied Materials Today, was launched last year to provide a rapid communication forum for cutting-edge applications of novel materials, now under the expert guidance of Professor Martin Pumera at Nanyang Technological University, Singapore. Building on these foundations, Elsevier has recently launched Materials Today Energy and Materials Today Chemistry, placing some of the most active and engaging areas of research center stage. These new complementary titles will support the community as highly visible forums for the discussion of significant new discoveries in key areas of materials science. 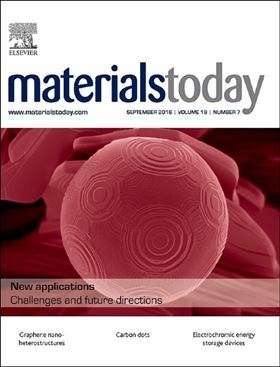 The extended Materials Today family of journals includes over 100 materials science journals published by Elsevier, including Biomaterials, Nano Energy, Carbon, and Polymer. 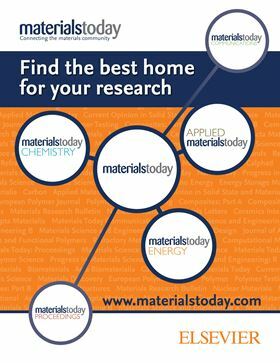 To complete the coverage provided by the new Materials Today portfolio of journals, Materials Today Communications is now providing a home for technically sound research in materials science, while Materials Today: Proceedings is dedicated to publishing peer-reviewed research presented at conferences. Closer connections between publications is expected to make publishing easier and more streamlined for authors, as papers can be transferred to the journal which offers the best fit, across the titles united under the Materials Today banner. Each of the Materials Today family of titles will be able to accept articles into Materials Today Communications based on existing reviews; a process that’s already in place and saving valuable time for thirteen materials science titles in the extended family. In a new era of communication, and with the boundaries between traditional disciplines blurring, the Materials Today family of journals will showcase all the latest materials science research from the big picture to the smallest – but often most crucial – detail. *Thomson Reuters Journal Citation Reports 2016. Click here to read more about the Materials Today family. A novel quantum material composed of hafnium, tellurium and phosphorus is the first to have multiple quantum properties.